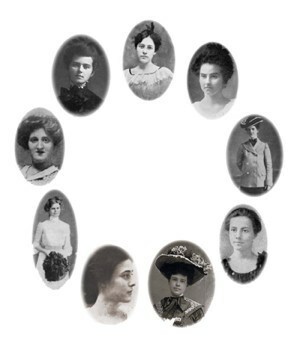 On Oct. 15, 1898, nine young friends at Virginia State Female Normal School formalized their friendship by forming Zeta Tau Alpha. ZTA’s future Founders all attended Virginia State Female Normal School to pursue an education in teaching. Away from home for the first time, these 15- and 16-year-old women longed for the companionship of close friends. Drawn together by similar beliefs and backgrounds, they were a lively group of fun yet earnest students. Fearing the unique quality of their friendship would fade without a formal bond to sustain it, the women contemplated their future. Spurred by the appearance of Kappa Delta and Sigma Sigma Sigma on their campus, and Alice Coleman’s invitation to join another women’s fraternity, the women decided to form their own. To guide them in the process, they turned to the brothers of two members. Maud Jones’ brother, Plummer Jones, was a member of Kappa Alpha and Phi Beta Kappa at the College of William and Mary. Frances Yancey Smith’s brother, Giles Mebane Smith, was a member of Phi Theta Psi and Phi Beta Kappa at William and Mary. Both were familiar with the fraternity system and had great knowledge of Greek lore. Smith suggested the name Zeta Tau Alpha, from the initial letters of the Greek motto upon which the organization is built. He also helped in selecting the badge, the motto, and the patron goddess, Themis. Plummer Jones revised the constitution, the original having been written by his sister. He also developed the ritual, including the initiation ceremony, the oath and the opening and closing of meetings. In an attempt to maintain anonymity, the women began formal meetings in secret. But even candlelight nighttime rendezvous in the ladies’ room could not camouflage their existence. Finally, they planned an Oyster Stew Announcement Party inspired by some oysters sent by Ethel and Alice Coleman’s father. Their group, however, did not have a name.